Amateur Radio Emergency Service (ARES) teams and SKYWARN weather observers along the US Eastern Seaboard went on alert Monday, January 26, as a winter storm began working its way into the Northeast. The storm, which brought blizzard conditions to some areas, shut down transportation and kept residents at home in several states. Eastern Massachusetts and the City of Boston may have been hardest hit, with record or near-record snowfall amounts and storm surge flooding in some coastal communities. ARES units on Cape Cod deployed to staff six shelters and the Multi-Agency Coordination Center, which serves Barnstable County. A shelter was opened on Nantucket Island, after the entire island lost electrical power as well as most telecommunication services, and ham radio volunteers helped to fill the gap. Amateur Radio volunteers relayed this information to the National Weather Service (NWS) Taunton Office, home to WX1BOX, where operations kicked into high gear on Monday evening and continued for 27 hours. Hurricane-force wind gusts were recorded on Nantucket Island and on the western edge of Martha's Vineyard. "Amateur Radio operators across Southern New England checked into regular SKYWARN Nets and/or with WX1BOX throughout the storm, even during the overnight hours, providing tremendous situational awareness and disaster intelligence information for the National Weather Service, state emergency management, nongovernmental organizations, and the media," Eastern Massachusetts Assistant Section Emergency Coordinator and SKYWARN Coordinator Rob Macedo, KD1CY, told ARRL. "Several hundred snowfall total and damage reports, including coastal flood reports, were fielded over a dozen SKYWARN nets across the NWS coverage area." Macedo said widespread snowfall totals of 15 to 30 inches -- and up to 3 feet in some areas -- occurred in Central and Eastern Massachusetts and parts of Rhode Island, while up to 2 feet of snow fell in Connecticut and Southwest Massachusetts. ARRL Headquarters announced on Monday that it would close on January 27 in anticipation of the severe weather. Massachusetts' South Shore experienced flooding, as a wind-driven tidal surge breached one seawall, flooding homes and businesses along the Brant Rock Esplanade. Flooding was also reported in Scituate, where streets filled with slushy seawater. Fierce winds caused some minor structural damage. A few residents had to be evacuated. ARES and SKYWARN volunteers elsewhere in the Northeast also relayed ground-level weather conditions to NWS offices as the severe storm continued its northeasterly trek. The winter storm may not have lived up to advance hype in some areas, leaving forecasters apologetic, but it was a significant weather event for Northern New England residents. While the worst of the storm missed New York City, extreme Long Island saw a couple of feet of snow. Eastern New York SEC David Galletly, KM2O, said ARES groups in his Section stood down at midday on January 27. "The storm track was apparently 50 to 100 miles east of the original forecast with a very sharp snow boundary," Galletly said. "This resulted in much less snow accumulation, especially in the Northern District counties." ARRL New York City-Long Island Section Manager Jim Mezey, W2KFV, said ARES teams in his Section spent Monday preparing for a storm that was anticipated to be of "historic proportions." By midday, he said, ARES members were awaiting marching orders. The American Red Cross had identified three possible shelter locations in Nassau and Suffolk counties, where ARES might have supported communication. "Winds were running at 25 MPH with higher gusts, creating whiteout conditions for most of the night and early morning," Mezey said. He reported snowfall accumulations of from 5 to 8 inches in New York City, 13 to 20 inches in Nassau County, and more than 24 inches in Eastern Suffolk County. By noon on January 27, ARES teams stood down but continued to monitor the situation a while longer. In Maine, where heavy snowfall and high winds battered eastern and coastal communities, ARES bumped up its alert status to Level 2 -- standby. Scattered power outages were reported, mostly in southern Maine. Temperatures remained in the teens. Maine ARES Section Emergency Coordinator Phil Duggan, N1EP, activated ARES Weather and SKYWARN Net sessions on HF, but no served agencies requested ARES communication support. 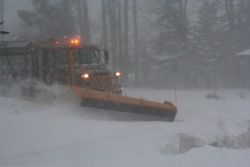 More than 1 foot of snow fell along parts of the Maine coast, and stiff winds out of the northeast caused considerable blowing and drifting of snow. At times, visibility was less than one-quarter mile. More snow is forecast for January 30. Starting on February 17, the FCC no longer will routinely issue paper license documents to Amateur Radio applicants and licensees. The Commission has maintained for some time now that the official Amateur Radio license authorization is the electronic record that exists in its Universal Licensing System (ULS), although the FCC has routinely continued to print and mail hard copy licenses. That will stop next month. In mid-December, the FCC adopted final procedures to provide access to official electronic authorizations, as it had proposed in WT Docket 14-161 as part of its "process reform" initiatives. Under the new procedures, licensees will access their current official authorization ("Active" status only) via the ULS License Manager. The FCC will continue to provide paper license documents to all licensees who notify the Commission that they prefer to receive one. Licensees will also be able to print out an official authorization -- as well as an unofficial "reference copy" -- from the ULS License Manager. "We find this electronic process will improve efficiency by simplifying access to official authorizations in ULS, shortening the time period between grant of an application and access to the official authorization, and reducing regulatory costs," the FCC Wireless Telecommunications Bureau (WTB) said. According to the WTB, the new procedures will save at least $304,000 a year, including the cost of staff resources. 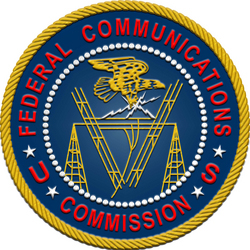 In comments filed November 5, the ARRL had strongly recommended that the FCC "give serious consideration to continuing a default provision for sending an initial paper license document to new licensees in the Amateur Radio Service, along with detailed, simple instructions for how to make the elections set forth in the notice relative to future modified or renewed licenses." Under the new procedures, a new license applicant who already has an FCC Registration Number (FRN) and provides a valid e-mail address under "Applicant Information" in the ULS will receive an official ULS-generated electronic authorization via e-mail. 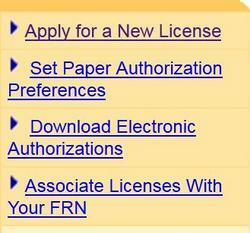 New license applicants lacking an FRN will receive one in the mail as well as a temporary password to access the Commission Registration System (CORES), but will no longer automatically receive a license document; they must request one by changing their "Paper Authorization Preference" in the ULS License Manager. The ARRL and other Amateur Radio commenters also worried that unless a license document is printed on distinctive paper stock, its authenticity could be questioned in such situations as obtaining vanity call sign license plates. To address this, the FCC said the watermark "Official Copy" will be printed on each page of an official authorization that a licensee prints out from the ULS. The WTB recently stopped using distinctive paper stock to produce hard copy licenses and has been printing these on "standard, white recycled paper." The Bureau noted that the distinctive paper stock it had been using was six times more expensive than the plain recycled paper it now uses. The ULS License Manager (left) now includes settings that allow licensees to notify the WTB that they prefer to receive official authorizations on paper. Once final procedures go into effect designating electronic access as the default, licensees can change the ULS License Manager setting so that the Bureau will print and mail a license document. Licensees also may contact FCC Support via the web, telephone, or mail to request paper licenses. The FCC rejected as "outside the scope of this proceeding" an ARRL argument that Section 97.23 of the Amateur Service rules be amended to replace "licensee mailing address" with other alternatives, including e-mail, for use in Commission correspondence. The rule, which requires that any licensee mailing address be in an area where the licensee has US Postal Service access, has precluded FCC issuance of location-specific call signs in such areas as Navassa Island (KP1) and some Pacific islands. The ARRL Board of Directors has bestowed the 2014 George Hart Distinguished Service Award on David B. Colter, WA1ZCN, of New London, New Hampshire. The Board may grant the award to an ARRL member whose service to the ARRL Field Organization has been of the most exemplary nature. The award's namesake is George Hart, W1NJM, long-time Communications Manager at ARRL Headquarters and chief developer of the National Traffic System. Colter, a member of the Twin State Amateur Radio Club, was recognized for nearly 4 decades of service to the Amateur Radio community, including such leadership positions as Section Emergency Coordinator and Assistant Section Emergency Coordinator. Colter designed training and development courses for the New Hampshire ARES community and was the prime mover behind the New Hampshire ARES Academy -- a day-long springtime event that provides courses and training in various aspects of public service communication. 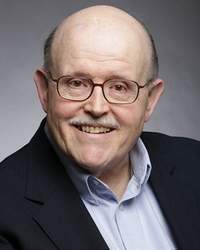 He also served as editor of the ARRL Amateur Radio Emergency Communications Course (ARECC) series and as New England Division representative on the League's Emergency Communications Advisory Committee. The Board also honored three professional journalists with the ARRL Bill Leonard Award for their outstanding coverage of Amateur Radio in video, print, and aural media. The award honors journalists for excellence in reporting that highlights the enjoyment, importance, and public service value of Amateur Radio. The award is a tribute to the late CBS News President Bill Leonard, W2SKE, an avid Amateur Radio operator and advocate. The video award went to Christine Kim of KSNV-TV in Las Vegas, for her "Local Heroes" profile of the Nevada Amateur Radio Emergency Service. The print award went to Marti Attoun of American Profile magazine, for her "Radio Active" article that profiled Amateur Radio. The aural media award went to Steve Kraske and Beth Lipoff of KCUR-FM in Kansas City, for their "Exploring Ham Radio in a Digital World" interview of Brian Short, KCØBS; Carolyn Wells, NØCJ, and Matt May, KC4WCG. The Board announced the award recipients at its 2015 Annual Meeting, January 16-17, in Windsor, Connecticut. 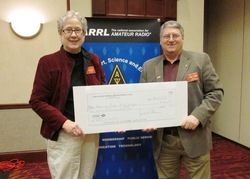 ARRL Hudson Division Director Mike Lisenco, N2YBB -- acting on behalf of the members of his Division -- has presented ARRL President Kay Craigie, N3KN, with an inaugural donation of $4500 to the new ARRL Legislative Issues Advocacy Fund. President Craigie received the contribution during the ARRL Board's Annual Meeting January 16-17 in Windsor, Connecticut. The check, from the Long Island Mobile Amateur Radio Club, represented contributions from members at the 2014 Hudson Division Awards Luncheon on November 8. President Craigie generously matched the donation. 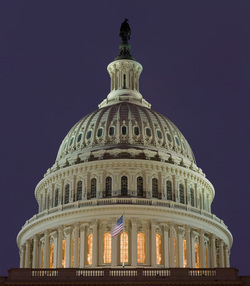 The Board's Administration and Finance Committee established the Legislative Issues Advocacy Fund -- proposed by Lisenco -- to educate and inform members of Congress of the importance of issues that impact the Amateur Radio Service. "There is an urgent need to raise money to help offset the cost of sending our voice to Washington for legislative advocacy, and we need to continue these expenditures into the future to achieve our goals -- including and going beyond the current CC&R legislative effort -- as there will always be issues that require a continuing presence on Capitol Hill," Lisenco said after the meeting. Lisenco added that potential issues down the road could include spectrum allocation -- and especially conflicts stemming from broadband allocations -- revisions to the Communications Act, the adequacy and efficiency of FCC enforcement and the use of Amateur Radio volunteers, increased privatization of Amateur Radio administration, FCC oversight, and radio frequency interference concerns, "to name a few." "We must establish a brand for Amateur Radio now, so that we no longer have to be reactive when it comes to the relationship between the federal government and Amateur Radio," Lisenco stressed after the meeting. The ARRL is a tax-exempt 501(c)(3) entity. All donations to the fund are tax deductable within the limits of the law. For information on how to donate to the ARRL Legislative Issues Advocacy Fund, contact Development Manager Lauren Clarke, KB1YDD (tel 860-594-0348). At its Annual Meeting, the ARRL Board adopted several legislative objectives for the 114th US Congress. Accordingly, the ARRL will continue to secure passage of legislation instructing the FCC to extend the requirement for "reasonable accommodation" of Amateur Radio station antennas -- a requirement that now applies to state and local governing bodies -- to all forms of land use regulation. The League also will continue to oppose legislation leading to the reallocation of amateur spectrum or to sharing arrangements that reduce the utility of existing allocations, as well as legislation that diminishes the rights of federal licensees in favor of unlicensed emitters or that encourages the deployment of spectrum-polluting technologies. Read more. The ARRL Board of Directors has elected members of the Executive Committee. Chosen during the Board's 2015 Annual Meeting were New England Division Director Tom Frenaye, K1KI; Hudson Division Director Lisenco; West Gulf Division Director Dr David Woolweaver, K5RAV; Pacific Division Director Bob Vallio, W6RGG, and Great Lakes Division Director Dale Williams, WA8EFK. The Board also chose members of the ARRL Foundation Board. Northwestern Division Director Jim Pace, K7CEX, was elected to fill the unexpired term of past ARRL Midwest Division Director Cliff Ahrens, K0CA, who stepped down from the Foundation Board. For full 3-year terms on the Foundation Board, the Board elected Director Frenaye, Rocky Mountain Division Director Brian Mileshosky, N5ZGT, and Martin Green, K2PLF. Frenaye, as ARRL Foundation President, reported that the Foundation funded some 80 scholarships in 2014, and that two new scholarships are in the process of being established. The ARRL Board heard reports from officers during its Annual Meeting. Chief Technology Officer Brennan Price, N4QX, told the Board that efforts are in full swing to build support for Amateur Radio-related issues, in preparation for World Radiocommunication Conference 2015 in November. General Counsel Chris Imlay, W3KD, pointed out in his report that spectrum auctions continue to pose a potential threat to Amateur Radio spectrum. He also told the Board that inadequate FCC attention to Amateur Radio enforcement issues continues to be a concern. Also present for the Annual Meeting were International Amateur Radio Union (IARU) Secretary Rod Stafford, W6ROD, and Radio Amateurs of Canada (RAC) Vice President Glenn MacDonell, VE3XRA. Stafford brought greetings from IARU President Tim Ellam, VE6SH, and Vice President Ole Garpestad, LA2RR, and noted that 2015 is the 90th anniversary of the IARU. The IARU is preparing for the International Telecommunication Union World Radiocommunication Conference 2015 this November in Geneva. School clubs are busily prepping their stations for The "Winter/Spring Term" School Club Roundup, which gets under way Monday, February 9 at 1300 UTC, and continues through Friday, February 13, at 2359 UTC. Stations may operate no more than 6 hours in any 24 hour period (up to a maximum of 24 hours). Senior Jacob Yarnell, KF5UVN, and freshman Mirah Gordon operate in the October 2014 School Club Roundup from K5LBJ at LASA High School in Austin, Texas. The twice-yearly event is an opportunity for school club stations -- from elementary school to college -- to get on the air for a friendly radio activity. Non-school clubs and individuals are encouraged to participate too. Sponsored by the ARRL, the ARRL Hudson Division Education Task Force, and the Long Island Mobile Amateur Radio Club (LIMARC), the contest aims to foster contacts with and among school radio clubs. Stations exchange signal reports, class ("Individual," "Club," or "School"), and US state, Canadian province/territory, or DXCC entity. Stations may operate on all amateur bands except 60, 30, 17, and 12 meters (no repeater contacts and VHF/UHF contacts must be on recognized simplex frequencies, except calling frequencies). Stations may operate phone, CW, and digital modes, or a combination. The most popular time for younger students is during after-school hours, but older students may be on the air anytime. All groups are limited to one transmitter on the air. If you'd just like to get on the air and hand out contacts, enter in the Individual category. Tune around in any mode and listen for SCR stations calling CQ, or call CQ yourself and see who answers (call "CQ School Clubs," if you are not a club station). Logs are due no more than 15 days after the operating period has ended and can be submitted online via the WA7BNM website. The top three entries in each category -- Elementary, Middle/Intermediate/Junior High School, Senior High School College/University -- will receive an Award Certificate. Non-school clubs or multiop groups and individuals are also eligible for certificates. The FCC has ordered an unlicensed California religious broadcaster, who sometimes broadcast on a frequency in the 40 meter phone band, to shut down his station. On December 31, the FCC's Los Angeles District Office issued a Notice of Unlicensed Operation to Martin K. Elliott of Inyokern, California. The FCC said it issued the Notice in response to a complaint of unlicensed operation on multiple HF frequencies, including some allocated to aeronautical stations. The FCC said its agents used radio direction-finding techniques to confirm that signals on 6280 kHz and 11,595 kHz were emanating from a residence located near Inyokern, and property records indicated that Elliott was the current owner and resident. "The Commission's records show that no license was issued for operation of a station on either the frequencies of 6280 kHz or 11,595 kHz at this location," the FCC wrote. "Unlicensed operation of this radio station must be discontinued immediately." The pirate station, which identified itself as "YHWH," was not cited for operating on Amateur Radio frequencies, although ARRL Official Observers had monitored the station in the past on 7185 kHz LSB. One short-wave listener said the operator of YHWH changed frequencies regularly. The FCC warned Elliott that operation of radio transmitting equipment without valid authorization violates federal law and could subject the operator to severe penalties including, but not limited to, substantial monetary forfeitures, equipment seizure, and criminal sanctions. The Commission gave him 10 days to respond. The FCC said its Notice "does not preclude this office from pursuing additional sanctions based upon our investigation of this incident." QRZ Logbook now recognizes contact confirmations from ARRL's Logbook of The World (LoTW). QRZ Logbook users now can download their contacts from LoTW directly into their QRZ Logbook. Contacts that exist in LoTW but not in QRZ Logbook will be added to your QRZ Logbook. LoTW automatically puts contacts made under a previous call sign into a user's current call sign account. QRZ will automatically put contacts into the logbook associated with the call sign used when the contact was logged. "Not only will this improve your confirmation rates, because you are receiving credit for your confirmations on LoTW, but it will also import records that exist on LoTW and not QRZ Logbook," QRZ.com said in announcing the new service. "Those QSOs may match another record on QRZ, resulting in even more confirmations." 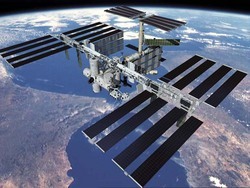 The NASA Goddard Space Flight Center (GSFC) seeks applicants to fill paid CubeSat and PICetSat-related internships for the Summer 2015 semester. These positions may be of interest to Amateur Radio licensees pursuing degrees in electrical or computer engineering and now in their junior or senior years. 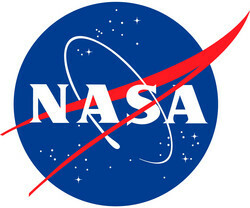 Applications are being taken on the NASA One Stop Shopping Initiative (OSSI) recruiting website. The openings are CubeSat Simulator Upgrade Plus -- advertised previously but now reopened -- as well as CubeSat Ground Station Development, and PICetSat Module and PCB Development. Other internship opportunities are available at each of the other 10 NASA field center locations as well, said Pat Kilroy, N8PK, of GSFC. The official application deadline is March 1, but Kilroy is hoping applications will be submitted sooner. "The word to the wise student is to get one's application in ASAP -- and certainly within the next 3 weeks," Kilroy said. 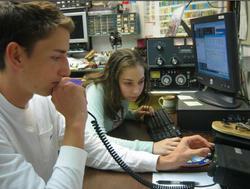 Applications from Amateur Radio licensees should include a call sign. Details on each internship are available through the OSSI page. Contact Pat Kilroy for more information. Applications must be submitted via the OSSI web page. Amateur Radio Club (TALARC) -- home to club station K9TAL at American Legion Headquarters in Indianapolis, which sponsors regular operating events. It also will explain how the American Legion is integrating Amateur Radio into its organization and for its members, how members can become licensed, and perhaps establish a club station at an American Legion post. 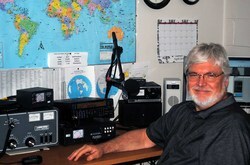 The Legion has an agreement with the Department of Homeland Security to provide assistance during emergencies, and Keith's article will discuss how Amateur Radio meshes with that effort. 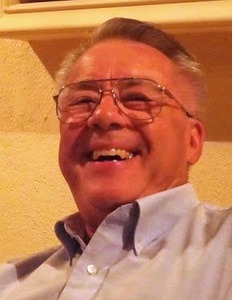 Keith has written more than 2 dozen books, including Riding the Shortwaves: Exploring The Magic of Amateur Radio, Firing Point -- a submarine thriller -- and Wizard of the Wind, which includes a ham as a key character. He has also written extensively about World War II history. The Radio Society of Great Britain (RSGB) has said it welcomes a recent initiative by telecommunications regulator Ofcom to combat interference from home power line data transmission (PLT) devices. The Ofcom "consultation" -- similar to an FCC Notice of Proposed Rule Making -- has invited responses by February 16. The RSGB Electromagnetic Compatibility (EMC) Committee has lobbied Ofcom to assume greater authority in cases involving violations of EMC rules. "These proposals make the regulations more resilient to evolving technology, when it causes undue interference to wireless telegraphy apparatus," the RSGB said. "The proposed changes aim to catch apparatus that exceeds the permissible levels in service," The RSGB said. A recent news article reported that Ofcom was proposing that individuals using power line networking equipment could face prosecution if it interferes with radio communications. The article, in The Telegraph, also said that GCHQ -- a security and intelligence organization similar to the US Department of Homeland Security -- has become increasingly concerned about PLT in recent years. The RSGB said the Ofcom proposals would provide additional enforcement authority with respect to a particular piece of equipment, not just a range of devices. "These changes are essential to prevent compromising important communication systems, particularly those that ensure public safety," the RSGB said. Pembroke, Curtis -- who was licensed at 14 -- was a space and Amateur Radio satellite enthusiast and occasional guest speaker. 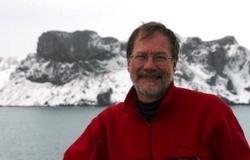 He also contributed to QST. An ARRL Life Member, Curtis was involved in emergency preparedness and held ARRL Field Organization appointments as Official Emergency Station and Volunteer Examiner. "The department lost a valued colleague and a good friend, and he'll be deeply missed," Dr Jason Hutchens, chair of the Mass Communication department, said. At UNCP, he received an Outstanding Teaching Award in 2012 and was named the Most Valuable Professor in 2012 and 2013. He had served as chair of the faculty senate and as president of the Friends of the Library Board. Read more. Belgium, Kesteloot was an electrical engineer and spent a decade in the Middle East installing TV and radio transmitters in the 1950s and 1960s. He subsequently signed on with the Central Intelligence Agency and spent 25 years as a CIA operative. Kesteloot was a recipient of a CIA Intelligence Star for Valor, and he served as executive vice president of the Association of Former Intelligence Officers. After retiring in 1994, Kesteloot joined the faculty of Phoenix Consulting, and trained Iraq-bound Special Forces units and intelligence agencies. An active AMRAD member, he was a frequent contributor to the organization's newsletter and papers. He also assisted in taking field measurements of Broadband over Power Line (BPL) systems in Virginia and Maryland. Kesteloot was an ARRL member and life senior member of the Institute of Electrical and Electronics Engineers. Average daily sunspot numbers for the January 22-28 period rose from 61.9 on the previous 7 days to 89.1. Average daily solar flux climbed from 126.2 to 136.8 over the same period. 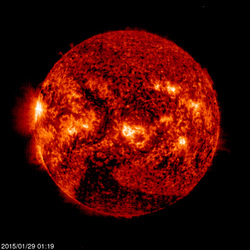 There were two new sunspot regions on February 22, another one on February 23 and again on February 25, four more on February 26, and another two on February 28. The average daily solar flux for January 29 through February 4 is predicted to be 165.7 -- nearly 29 points higher than the previous week. Predicted solar flux is 165 on January 29, 170 for January 30 through February 2, then 160, 155, 145 and 125 for February 3-6, 130 for February 7-9, 125 for February 10-11, 120 for February 12-13, and 125 for February 14-16. Flux values will reach of low of 115 on February 18, then a high of 135 during the period February 26-28. Predicted planetary A index is 12 on January 29, 15 for January 30 through February 1, 12 on February 2, 10 for February 3-4, 5 on February 5, 10 for February 6-7, 8 for February 8-9, 5 for February 10-14, 12 on February 15, and 10 for February 16-18. In the Friday, January 30, bulletin expect an updated forecast for the near term and reports from readers. Send me your reports and observations.